Entering the season, things appeared a little bleak for the Dukes of York. They only had one returner that went sub 10:00 in the 3200m last year in Ethan Kern, who only ran 9:52.35. The only two people who we knew would be able to help carry this team were Kern and Daniel Klysh. Coach Kern really developed the team phenomenally over the summer to prepare them for the upcoming year. They came out of the gates a little slow without young Kern, taking 5th place at the Joliet Steelman Invite. Despite the Dukes lackluster showing, this race provided insight into the potential of some young sophomores down on the frosh/soph level as they placed 1st-4th in the frosh/soph race. They really showed what they had at the Peoria Notre Dame Invite coming away with great performances on the frosh/soph and varsity levels. Ethan Kern took second to the future state champion Josh Methner, Klysh nearly broke 15 by running 15:02, Colin Hill took second on the frosh/soph level running a 15:26, Thomas Braun took 5th on frosh/soph with a 15:52, Mickey Vreeland took 6th on frosh/soph with a 15:54, and Sam Ayers took 9th on frosh/soph with a 15:59. This meet confirmed that York had the talent to do big things, as they took 6th in the varsity race without those stud sophomores. The first time the Dukes ran their actual top seven came at the Peoria Invite and boy did they impress. They ran some blazing fast times on the historic Detweiller Park, including Ethan Kern going 14:25, Klysh going 14:38, Hill going 14:54, Michael Moriarty going 15:22, and Ayers going 15:25. This was huge for the Dukes as it signified how far they had come to that point under the guidance of Coach Kern. They ended their season with a 4th place finish at the state meet and return everyone from their top seven next year. Coach Kern was faced with a tough situation but found the talent in what he had and used it to make a great team. 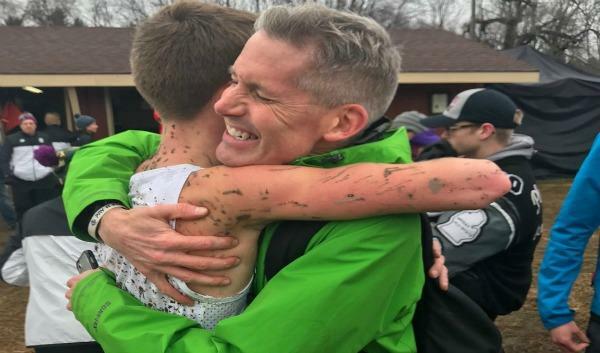 Congrats to Coach Charlie Kern Sr. on being the 2018 Milesplit IL Boys Coach of The Year!